This activity was developed by Med-IQ in collaboration with Duke University Health System Department of Clinical Education and Professional Development. Overview: In this brief case-based activity, meet Karen, a fictional 30-year-old woman whose mother recently died of ovarian cancer. Karen is now asking whether she should undergo genetic testing or ovarian cancer screening. As you move through this activity, read through links to useful resources to help you make clinical management decisions for Karen. You will also receive insights from expert faculty Andrew Berchuck, MD, on the latest recommendations for genetic testing and risk-reducing strategies for hereditary ovarian cancer. This activity is intended for community gynecologists and oncologists. Approximately 9% to 24% of epithelial ovarian cancer cases are caused by germline mutations in BRCA1 or BRCA2 genes. Many women are often not referred to genetic counselors for genetic risk assessment and testing. Furthermore, many healthcare providers are not familiar with guideline recommendations on risk-reducing surgeries. For these reasons, gynecologists and oncologists need to be aware of the updated 2017 American College of Obstetricians and Gynecologists/Society of Gynecologic Oncology clinical management guidelines on genetic testing and risk-reducing strategies for hereditary ovarian cancer. This CME activity consists of a 0.25-credit online publication. 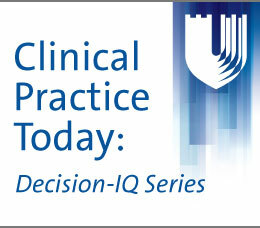 To receive credit, read the introductory CME material, read the publication, and complete the evaluation, attestation, and post-test, answering at least 70% of the post-test questions correctly. Consulting fees/advisory boards: Merck & Co., Inc.